Looking at the current roster, with minimal attention paid to the 2012 recruiting class. Only Chris Polk, maybe the best running back in UW history. On a play-by-play basis, Napolean Kaufman and Corey Dillon and probably a few others may have been more dangerous, but no one was as consistently dominating, punishing and dependable as Polk. He ran incredibly hard and was the perfect back to run behind a mediocre offensive line. I wish we could have seen what he would have done with some better running room. Sarkisian has said several times that no one has better embodied the type of program he wants to run than Polk. He was mainly talking about his toughness and physicality, but I think it could be applied to Polk’s personality as well. He’s known as a talker, a little bit brash, but a huge competitor, teammate and leader. He will be sorely missed and remembered as a true Husky Legend. There are other running backs on scholarship (see below), but Callier and Sankey are the two who received extensive playing time last year. Callier has received a good number of carries the last two years, mostly as a change of pace to Polk. He gets a lot of end-arounds and runs outside the tackles, and even runs the wildcat (WildDawg!) on occasion. Callier has been solid, if mostly unexciting. He doesn’t seem to quite have the electricity to make up for his apparent lack of physicality that keeps him from being more effective between the tackles. That being said, his chances have been limited and I’ll be curious to see what he can do if he gets more regular carries this year. He was a ridiculously productive high school player. I’m skeptical he can be an above-average starter, but he’s an excellent back-up at worst. 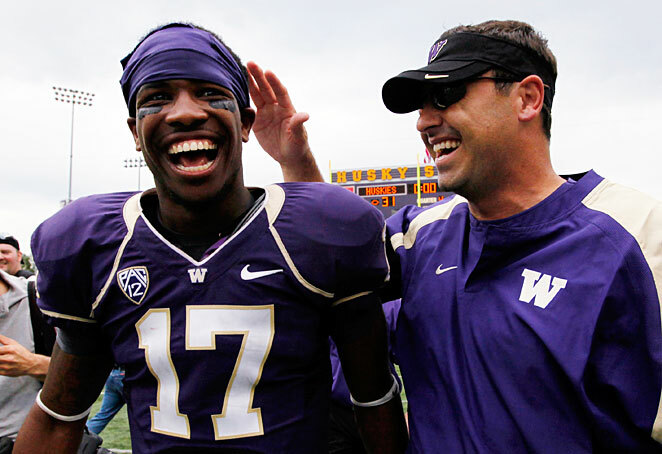 The last week has been a wild one for University of Washington football. Between the Alamo Bowl, coaching changes, and recruiting news, there have been no shortage of emotion swings. I’m going to save the recruiting talk for a future post, but I want to offer some thoughts on the rest of the news. Can any state match the Oregon universities for region-appropriate but completely unthreatening mascots. Beavers are super-cool, but what are they going to do on the football field? Gnaw your leg off and wap you with their tail? Slowly build a dam that will funnel the opposing offense toward a waterfall? That dam defense bends but doesn’t break! I have to admit, ducks are among my very favorite birds, and I really like birds. They have a certain je ne sais quoi. Mystery hides behind their bills and well-groomed feathers. But put them on a football field and you just get this. UW comes into Corvallis licking it’s wounds after two straight weeks of getting thrashed by superior conference foes. Oregon and USC exposed so many weaknesses in the Dawgs top to bottom, I’d bore you to death with the details. All you need to know is they got rocked. Thankfully, they get Benny the Beaver this week, and he is not a superior foe. OSU has struggled all year to be competitive (except for the beat down they administered to Wazzu), and I expect that to continue this Saturday. It’s senior day at Reser, so emotions will be high, but that’s all they have going for them at home. A porous defense that has given up over 800 yards on the ground over the past three games should be a welcome sight for the Huskies. With Nick Montana making his first ever start, I expect Sark to called Chris Polk’s number all day. I better see 30 carries from #1. I have a good feeling Polk will deliver. Sean Mannion is a legit, strong armed, up and coming QB in the Pac 12. Even though just a freshman, coach Riley has handled the program over to the young signal caller. He’ll play with confidence and throw a lot to his stable of solid WRs. Since the UW secondary is terrible, expect to see OSU throw and throw often. In the end this game will be about tempo and ball control. If UW expects to win, the ball must be in the best players’ hands, i.e. Polk, ASJ, Kasen. If Montana finds those guys, I like the chances of winning. These next 2 games will define the season for the Huskies. If they beat OSU and WSU, which they should, then the season will be seen as a success and another step forward for the program. If they drop one of these games then it’s hard to be as excited about this season. So, this game means more than just playing a team with 2 wins. To be perfectly honest, I don’t know why the line on this game is so low. The Huskies are clearly a better team even if they have their backup quarterback. Oregon State isn’t very good, but they will play hard and will play with emotion. If the Dawgs are able to get their running game going and play decent defense they should win this game by double digits, but it’s hard to know if that will happen after the last couple of games. I’m thinking that Chris Polk will make sure his team is ready to go. As for Nick Montana, I think he’ll be efficient and will wow us and then make us scratch our heads every once in a while. This game has me nervous, but not nervous enough to pick against the Huskies. My emotions are swirling heading into this game tomorrow. That’s not terribly unusual, but this game in particular has me anxious. A month ago, the Huskies were rolling and the Beavers were playing like the Beavers we remember from the 90’s. As it stands today, UW has lost 2 in a row, and coming out of its toughest stretch of the schedule, the team is beat up physicially, emotionally, and most likely mentally. The Beavers are not exactly surging having lost 3 straight, but they are as healthy as they’ve been, and from what I’ve heard the team is practicing hard, and in no way resembles a typical 2-8 football team. No matter how you dice it, the Huskies are better at nearly every position, on both sides of the ball. The offensive line’s struggles have been well documented, but the truth is all 5 starters would probably start for the Beavers. The talent gap is large, but that has never prevented the Beavs from competing well, especially in November. I expect a heavy dose of Chris Polk tomorrow, but then again I expect that every week, and sometimes it doesn’t happen. For me, the 2 factors that scare me most are the Keith Price injury, paired with the weird juju that often occurs at Reser in November. I smell an upset, and a frustrating afternoon. With Nick Montana getting the start and the Huskies’ recent swoon, this game had me pretty worried. Then I realized how bad the Beavers have been most of this season. I guess I’m so used to the Beavers being a tough game, especially late in the season, that I just assumed the Huskies would end up with the loss. I could still see that happening, but OSU isn’t a major threat. The rushing numbers are so heavily in UW’s favor that they should decide the game. We’ve heard things like that before, of course, and it often doesn’t work out. I have a feeling that this time, it will. Montana should be good enough to keep the defense honest, and Polk should have a huge day. Go Dawgs! On Thursday night I wrote about what tonight’s game meant for the Washington football program. A win, or even a respectable, hard-fought loss would have earned this team national respect and shown that the Dawgs are another step up Sark’s metaphorical mountain. Well, instead of that happening, the Huskies took out their toboggans and sled down the mountain as if it were the historical December of 2008 (Ty’s last game as Husky head coach). Being out of the game at halftime was a sight Husky fans have grown accustomed to seeing but we thought it was behind us. Tonight it wasn’t behind us and that’s a pretty disgusting and annoying feeling. The defense didn’t move and the offense, while racking up quite a bit of yards, didn’t have the firepower to stay with a physically dominant Stanford team. The Huskies will be elite again soon, we’ve seen flashes of it, but that doesn’t change how frustrating that game was. There. I’ve said it and it’s out my system. As far as the Good Guys go, Dan and Joe are usually the emotional reactors. They have no problem telling us about how much our teams sucked it up. There’s value in that because without it, you get the Cougar syndrome (I’ve coined this phrase right now and I do apologize Cougar fans) and then, you justify your team keeping a coach for a 4th year even though he’d won 2 pac-10 games in his tenure. Matthew and I usually take things a little differently then that and try to be a little more optimistic (as hard as that is with Seattle sports). There’s value in that too, especially when talking about the Huskies this year. It’s easy to get greedy, and start dreaming of Rose Bowls but the truth is this team is still only 3 seasons removed from 0-12 and has made steady progress each year. Having said that, Dan was the one who sent me a text to remind just how far the Huskies have come in a short amount of time and how great this coaching staff has been for the program. There is progress being made and there’s no reason to doubt that progress won’t continue, even after tonight’s debacle. No, maybe the Huskies aren’t quite ready for a regular slot in prime-time. They are a good football team, who clearly wasn’t at their best tonight, that is fun to watch and will continue to grow. If they plan to continue to grow they have to forget about this game quickly. Sark has a 24 hour-rule, where the team is allowed to think about the game for 24 hours afterwards whether it’s a win or a loss. From what I can tell in his tenure, this rule has worked and the team has generally shown up to play the week after an ugly loss. Maybe this week the 24 hour-rule should turn into a 2 hour-rule though. And maybe this rule should go for fans this week too? There is no point in dwelling on this game. There may be a few teachable moments for the team, but mostly they got beat by a much better team tonight. That might not be the case next year, but it is this year. Because of that, it’s time to move on. Once the team gets off that plane tonight I hope Keith Price is smiling, Sark is scheming up some more amazing offensive game-plans, Nick Holt is coaching instead of screaming, and our Dawgs are ready to beat the crap out of Arizona. Most people have probably heard about the Arizona-UCLA game Thursday night. It had a lot of implications for a Thursday night game between two bad teams, namely that it’s probably the game that ensures Rick Neuheisel will be fired and it might signal a bit of an awakening for the Wildcats. The most interesting part of the ingame action, though, came with 8 seconds left in the first half. UCLA was lining up for a possible Hail Mary when someone ran on the field from the stands. Like usual, the cameras didn’t show him, instead focusing on a shot of a referee and some players. Suddenly, those players took off running and a full-scale brawl broke out. When it was eventually broken up, two players were ejected, Kevin Prince threw an unsuccessful pass toward the end zone, and both teams walked off, the coaches looking disgusted. I understand why they don’t show streakers or other people who get on the field. I personally would rather see what’s going on, but the idea of not giving these people attention is fine. However, I find it ironic that they won’t show some dummy running through the end zone, but they’ll show a fight between 100 college kids that perfectly embodies the poor sportsmanship that society discourages. I’m not saying that TV should show the guy on the field or shouldn’t show a brawl. I just think that if the choice is between having someone toilet paper my house or break in and beat me with a baseball bat because they don’t like how I care for my yard, I know which option I’m picking. Moving on, I came across this article on WSU running back Carl Winston. Winston has 224 yards rushing on the year, with a high of 47 in one game. In the article, Paul Wulff names Winston as his offensive MVP so far this season. I’m not trying to pick on Winston, and I honestly don’t remember seeing him play, so maybe I’m underrating him. Still, let’s compare him to the Husky options for offensive MVP. The clear choice is Keith Price, who is on pace to obliterate most UW season records for a quarterback. He is currently fifth in the nation in passer efficiency and second in touchdown passes. If not for that guy in Stanford, he’d be the clear choice for all-Pac-12 QB, in my opinion. Even if you don’t want to go with him, Chris Polk has about 500 more yards than Winston and is second in the conference in rushing. I’m not meaning to pick on the Cougars here; they are significantly improved this season. Wulff’s comment just reminded me of the Huskies in the last few Willingham years. I’m sure it’s at least partly coachspeak. If he had to pick one offensive guy on his team, I’m guessing Winston would be at least third, behind Marquess Wilson and either quarterback. Wulff’s reasons for calling Winston his MVP consist mainly of his excellent blocking and toughness. Not sure where I was trying to go with this, but I guess I’m just glad that the Huskies can now recognize players for their incredible production, rather than for their incredible toughness. Well, this is an exciting game! One team has only lost once in their last 10 games and the other has the longest winning streak in the nation. The whole world thinks Stanford is the better team, and rightfully so. They are older and the more proven team. A writer for uwdawgpound.com pointed out that they execute extremely well and don’t make many mistakes. But, he also pointed out that Stanford doesn’t have any absolute stars on the defensive side of the ball (especially now that Skov and Howell are out). When you think of their offense you think of power running, tight-ends, and a quarterback who is the best in the nation. Now, the Husky D isn’t set up to stop the quarterback, no one is, but it seems built to do well against the others. Stanford will get yards, no doubt about it, but I see a little reason for optimism. I don’t see any reason to doubt our offense won’t score either. They are too good not to score. Stanford has been incredible in the 3rd quarter though (and the 1st quarter but so have the Huskies), and that’s what scares me. It’s what happened against Nebraska and I’m scared that the Dawgs won’t be ready for the fateful 3rd. If they are, I see them winning to be honest. There’s more NFL talent on the Husky roster in my honest opinion, it’s just young talent. Maybe I’ve talked myself into something bad here. The Huskies will either get blown out or win a close game, that’s what they do in these games. But, I’m thinking that tomorrow we win. This team has been doubted too much and, dang it, I’m ready to believe in them and believe that they’re going to win every single week. Plus, they’re playing trees… While big, they aren’t agile. Let’s do it Huskies! Forget the Holiday or Alamo Bowl, after tomorrow lets be talking about the Rose Bowl! When I analyzed the schedule this past summer and tried to project outcomes, at Nebraska and at Stanford were my only lock losses. I just could not envision a scenario, at the time, where the Huskies would march in and win either of those games. I still don’t think Washigton has a great chance today, but I certainly feel better than 3 months ago, when I see Stanford on the schedule. This game can be broken down a million ways. The 41-0 loss last year seems like it should be part of the conversation, the fact that this game is on national tv is intriguing, luck vs. price, etc. To me, it’s as simple as this: Stanford offense-GOOD, UW offense-GOOD, Stanford defense-GOOD, UW defense-BAD (maybe average). I think UW is at a point where we can keep this game fairly close most of the way, but until our defense is top 25 good, we won’t win many of these games. I just don’t see us stopping Stanford, not for 4 quarters anyway. The only scenario where a win is possible, in my mind, is if the defense forces some turnovers, the offense scores TDs rather than FGs, and we get lucky…impossible to do this post without one luck pun. It’s still really hard to predict what these Huskies will do on a weekly basis. I think Stanford is still notably better, at least on defense. The Husky offense is so balanced and creative, but this is the best defense they’ve played. The UW offense is the best Stanford has played as well. This might come down to who makes mistakes, which isn’t usually Stanford, but it isn’t really the Huskies either. I really want to pick the Huskies, but when I think about this game, all I see is Andrew Luck throwing to his tight ends on third down. Here’s guessing the UW defense isn’t quite ready to stop him.